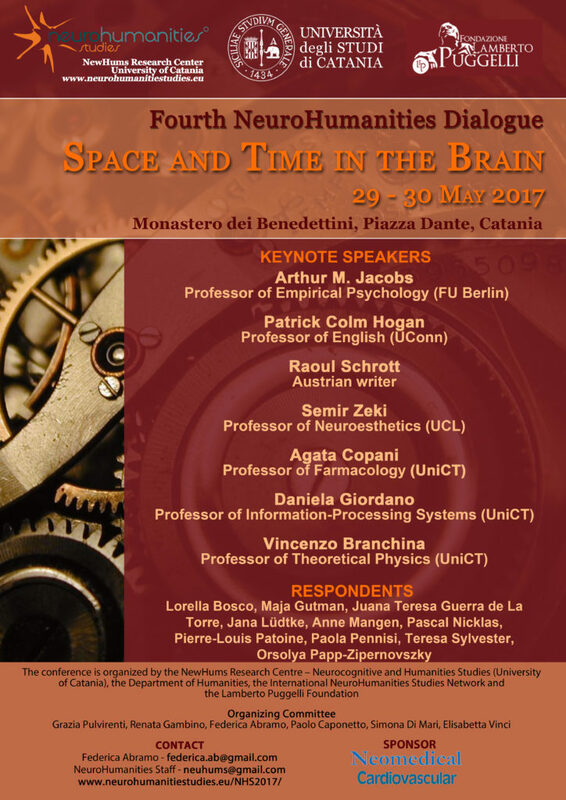 Following the three NeuroHumanities Dialogues focused on “Neuroaesthetics and Cognitive Poetics” (2014), “Metaphors as source of creative thought” (2015) and “Ars et Ingenium: The Processes of Imagination” (2016), the NewHums Research Centre of the University of Catania is pleased to announce the Fourth Dialogue between neuroscientists and humanists. The peculiarity of the meeting relies on its format: a real dialogue between scientists and humanities scholars with plenty of time for discussion and a final roundtable with respondents. Main focus of this year Dialogue is the investigation of the perception system and cognitive system analysis of Space and Time in the Brain. The way in which we approach to literary texts, work of arts and everything which is shaped and created by our mind involves different mental activities. These also include the elaboration of two great mysteries of human perception: the space, which surrounds us but also includes us, and the time which accompanies us during the act of fruition. Since ancient times philosophers and scientists have been tried to grasp and define space and time, because they are among the basic vital relations of the human being. They build up the framework of our perception, experience and cognition. Their representation can be traced back in the old myths about the origin of mankind, like the Greek personification of time, the God Cronus, and the concept of Kairos intended as the supreme moment. Epistemology and ontology of space and time and their representation in human cognition have been the focus of attention in both scientific research as well as in philosophy, aesthetics and literature. The ongoing research regards the underlying neural correlates of temporal and spatial processing, the interrelation between processes and representations of time and space, the disturbs in time and space perception, the combination of space and time into an interwoven continuum by applying mathematical models, the developments of Einstein’s theory of relativity, and many further issues related with the spatio-temporal cognition. As in case of the most complex and fascinating features of the human mind-brain, many questions are still unanswered and require a trans-disciplinary approach in order to gain new insights. During the new NHS Dialogue we intend to approach to the mysteries of Space and Time from the perspectives of disciplines like neuroaesthetics, neurocritics of art, neurophenomenology, neuropsychology, cognitive linguistics, and literary studies.